Training Siamese cats can be simple, as long as you understand how cats learn. They each learn differently depending on the experiences they've had. Depending on these experiences your cat may enjoy doing what you teach him or may dislike it entirely. It all depends on if his past training experiences were good or bad. Of course, the attention span, intelligence, and even curiosity levels of your cat will help to determine how quickly easy he will be to train. Something to keep in mind when training Siamese cats is to be sure that you make it a pleasurable experience for him. A common mistake when training cats is to try to discipline the cat like a toddler. You shouldn’t use punishment as a training method. This could end up backfiring and probably won’t give you the results you're looking for. In fact, it may simply end up frightening your cat, making him aggressive, severing any bond that you have with him, and counter-acting any training that he may already have succeeded with. An example of improper training is when a cat goes to the bathroom outside his litter box. Most people go about solving this problem the wrong way, such as putting their cat back inside litter box and forcing them to dig their claws into the litter. This is not a productive method of litter box training and should be avoided. It will give your cat a bad association with the litter box, and will make him think of it as a punishment. Instead of using punishments, try using a reward system. If you don't want to deal with cleaning your cat's litter box, consider cat toilet training. It's a lot easier to teach cats than you might think! When training Siamese cats or kittens, it's a good idea to learn how to keep cats away from certain areas in your home. If you keep them in the right surroundings, they are less likely to adopt any unwanted behaviors. When training your cat, put netting on your furniture to refrain the cat from scratching it. Cats hate to get their claws stuck on things, and netting is a perfect tool to use. Use aluminum foil or 2 sided tape to keep your cat away from certain areas. Spray some menthol or citrus on areas surrounding a "cat free" zone. Using this scent will repel your cat from places you don't want him to be. Boredom in cats can develop into destructive behavior. To keep this from happening, set aside regular play-times to release your cat's pent up energy. A technique that will discourage unwanted cat aggression when training cats is to grasp your cat by the scruff of the neck. This works well because it mimics how the mother cat would discipline her kittens, promoting submissive behavior. With a firm grip, grab hold of the scruff (this is the loose skin on the top of the neck). Don't grab it roughly. You don’t want to come across as aggressive, only dominant - like the cat's mother. You also don't want to hurt the cat. Press the cat firmly down on the floor, saying in a strong tone "No". Once again do not be rough. Continue holding your cat down on the ground until he begins to relax. While doing this, be sure to remain calm and assertive. Once your cat is completely relaxed, let go and pet him, being sure to give him plenty of praise. If you see two cats engaged physically, you can simply throw a blanket or towel between them to break up the fight. Important note: Do not attempt to do this if your cat is in a violent fight with another cat. If you do you are at risk of getting scratched or bit. Important note: Don't pick up an adult cat by the scruff of the neck without providing hand support for him under his body. If you don't, the cat can end up with serious internal damage. Also, do not hold cats like this for any length of time. You always have to be gentle and patient when training cats. Have you ever wanted to take your cat for a walk outside? It is possible with a little bit of patience on your part. You’ll need to buy a cat harness that fits comfortably, and have a lightweight cat leash with a secure clip on it. Don't use a collar on your cat because he can easily slip out of it. You want the cat leash to tug on your cat's chest not his throat. If you don't want to use a cat harness you can use something called a walking jacket. This is pretty much escape-proof, and comes with a lease attached at the middle of the back. Put your cat harness and leash somewhere near where your cat sleeps. Leave it there for several days so your cat gets used to the scent. When you put the harness on your cat, you should be able to slip two fingers in between the harness and your cat's skin. Right after doing this, give him his favorite treat and lots of praise. Keep the harness on him for awhile. If your cat seems bothered, try to distract him with a toy. When your cat has gotten used to having the harness on, remove it. Repeat the previous steps for several days, leaving the cat harness on for a little longer each time. Attach the cat leash to the harness, and have the cat walk around the house with the lease dragging behind. Pay close attention though, making sure he doesn't get tangled up in the leash. Give plenty of praise, and repeat these steps until his is used to the harness with the leash attached. Next, have your cat walk around wearing the leash and harness, but this time pick up the end of the leash and follow him around. Hold the leash loosely, being sure not to restrict his movements. Practice this for a few days. Training your Siamese cat to follow your lead by giving direction, and pulling lightly on the lead. This should be a fun experience for him, so don't be rough. If he tugs at the leash, simply stop until he relaxes again. 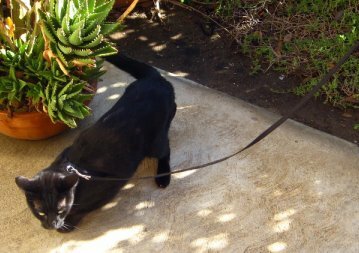 Finally, gradually move outdoors with your cat on the leash. Walk him in your own yard at first, increasing the time spent outside each day, then try moving out to more public locations. No matter what you are trying to train your cat to do the experience should be a fun and rewarding one for you and your pet. Using rewards rather than punishment means that you cat will start doing what you want him to out of choice rather than out of fear, which is what you should be aiming for.